Oct - Is flooding imminent? Eddie "The Eagle" Edwards who represented GB in the winter Olympics in 1988, coming last in ski-jumping, attaining celebrity status as a result. Text and photos except where noted © Eddy Edwards 2010-16. Please do not use my material without permission. Your help would be appreciated, please e-mail me (Eddy) Your response will be added unless you ask otherwise. "Ouse Washes" is a relatively modern term used (since the 1970s ?) 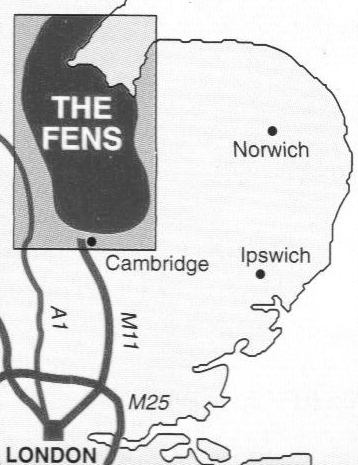 to refer to the floodplain known for more than three and a half centuries as the "Hundred Foot Washes" - a small, but very important, part of the flat low-lying peat 'fen' lands in 'East Anglia' (the eastern part of England). The area, locally simply called "The Washes", is a long, narrow strip of land through which the waters of the Great Ouse River flow in various man-made channels en-route to the sea. The strip is 21 miles long overall, but only 19 miles is (now) subject to flooding. Note that there are floodplains elsewhere in East Anglia also locally called The Washes e.g. 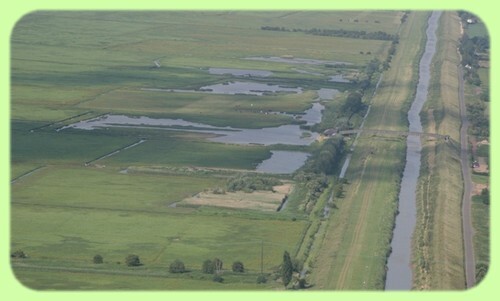 the Nene Washes, and also in other parts of England. As I will try to explain, there is much to cause confusion if not properly defined. Please also note that this project and website are personally funded and not affiliated to the Ouse Washes Landscape Partnership [Scheme] which launched fully 12 months after mine, or its lottery-funded website with a similar domain name to mine. My project is limited to the Ouse Washes as defined below ; theirs includes communities around the Washes and places some distance from the Washes, and also promotes fen-land tourism, arts and crafts, and some expensive long-term dreams. 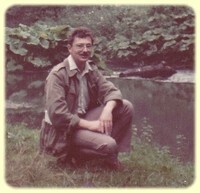 I'm Eddy Edwards and I came to live and work not far from "The Washes" in the 1970s. To me they seemed rather mysterious, where cattle and sheep grazed in summer, and in winter they were flooded and invaded by swans. Ordinary folk didn't venture into them, and few roads crossed them. In winter the rivers inevitably drowned all but one road at some stage causing frustration, long diversions and delays. Information from the river managers was sparse so most people didn't know in advance and those who could read the signs didn't tell. The only road that didn't flood wound slowly through a small village where normal traffic volumes were bad enough, but when swollen by diverted vehicles, it was awful, for both residents and motorists. For many years I just accepted the situation, and was grateful when one road was raised a little (the A1123 at Earith by 10 inches in 1978) which made winter travel a bit easier, and a by-pass built at another (A142 at Mepal, 1984) to the relief of all. There was some hope in the early 1990s that a third crossing (A1100 at Welney) where the road was, and still is, regularly inundated for weeks, sometime months, would be raised, but according to the local website in 2010 no solution or even improvement is likely. There has been much talk about this again in 2015/16 and predictions that something will, at last, be done. I'm one of many not convinced. In the 1990s I began to make occasional forays along some of the river banks, and in the late 2000s I visited more often, this time with a camera, but I had no plan at that time to properly record what I found, or connect the operation of one place with any other. Later, in the very early 2010s, I tried to find out why the seemingly simple process of moving the river from one end of the Washes to the other without disrupting peoples lives every winter seemed beyond the abilities of those in charge. I discovered that in fact it was by no means straightforward, and there was a complicated "system" to try to balance various, and sometimes conflicting, interests. Management of "the system" has passed from one body to another (four in my short time here) although many personnel were retained by the successor organisations. Each new body was either bigger or more "focussed", or both, than its predecessor yet still seemingly unable to do any better, and still no-one able to explain "the system", or "the problems", in a way I could fully understand. No-one agreed anyway, the same question to a dozen people would get as many different answers. And I got the feeling that some officials did not always tell the full story; the truth	perhaps, but not the whole truth. (I must add that the EA staff I've met since 2013 contradicted that view, seeming very frank about their roles and providing a good deal of current and historic information about the management and operation of the Washes water-control structures for which I am most grateful) . So began my project in January 2011, to learn what "the system" involves, and to attempt to make it understandable to others. In the process I've become fascinated by the various engineering structures in, around or effecting the Washes and their links to bygone ages and I've discovered that while there's lots of stuff on the web about the flora and fauna and recreation (boating, fishing and shooting), and many photos of floods, sunsets, swans and ducks, their's not very much about the engineering aspect, and what there is is limited to specific areas. To learn how the Washes are managed in the face of diverse interests of flood defence, drainage, irrigation, grazing, conservation & recreation. To monitor current flood control actions, compare them with agreed plans and establish reasons for any differences. 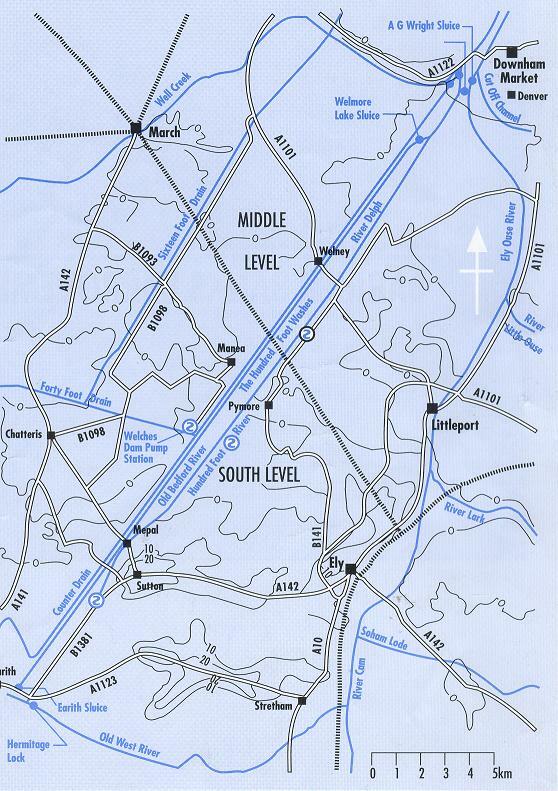 To walk both banks of the Old and New Bedford Rivers recording every structure affecting or controlling the Washes. 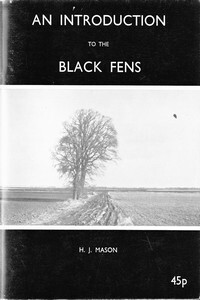 To research the history of the people and organisations responsible for the Washes and the structures they built. Occasionally I've veered off-course, away from the Washes and their immediate surrounds, to Ely, Littleport and Upwell, but in all cases there is still a link with the Washes. Since autumn 2015 I've also made another departure from the aims above, in that I've begun to give talks illustrated with sideshows on some subjects, with much more coverage than shown on-line (see menu for link) and during 2016 I intend to publish some booklets and guide books. So although updates to this website have quietened down since 2014, my passion to learn and inform is as alive as ever. My walks began where the Washes begin, at Earith. Why not have a quick look there, then pop back here. I've learned to question some of the things I read during my researches, and wherever possible I've consulted the earliest available sources and compared one with another. It's suprising how many relatively recent writers have simply repeated earlier mistakes. Initially, I made great use of Cambridgeshire's public libraries. Later, I built up my own extensive collection of books, maps and documents going back to the 1740s, many of which are shown on the right. Linger here for a moment, and see the scrolling book covers and titles. I have made use of those throughout the site and I've also obtained very many others during the project. I am greatly indebted to all those who have provided other documents, photos and information, and they are acknowledged where the material has been used. If this remains displayed, your computer's settings need attention or you may need to "allow blocked content". I launched this website in May 2011 with just a single page. By September 2012 there were 40 pages, and by Feb 2016 a further 20. A variety of face-lifts have been tried on selected pages. A site logo is being rolled out together with new headers, the latest with a titled slide show within a container with rounded corners and a bottom shadow. Menu and comment boxes are receiving similar treatment. However, it is still very much work in progress, in both content and display. There are no distracting adverts or sponsor logos, but lots of navigation links and tables for easy access to basic facts with further links to detailed pages and photos. Pop-out navigation menus on the main pages enable viewers to get to virtually every page or page-section with just one or two clicks and quickly zip around the site. I tried a menu that floated down and was always visible as you scrolled - it enabled instant access to contents (page and site) without losing where you were - but that does not work well on tablets and smart-phones which were little used when the site was first designed. Starting in March 2016 I'm replacing that with a floating "back to top of page" link in the left column which should provide easy and rapid access to page contents and site index. I've added some slideshows, some with and some without changing captions, some within existing pages running automatically as here, others as stand-alone shows which can run automatically or be manually controlled. My "guided tour" slideshows will become an increasingly important part of this project. Page width is 960px to fit older conventional (non wide-screen) monitors and tablets, etc. Some photos may take a long time to appear, and I'll deal with that later; in the meantime please be patient. Pages will be amended, expanded or occasionally replaced by others, and new ones added, as my project progresses. Some pages lack content or have images missing, and inevitably there'll be broken links, but those shortcomings will be fixed as my project advances and time permits. A "wash" is simply a piece of pasture land that is flooded every winter either naturally or intentionally, and grazed in summer. In the Ouse/Hundred Foot Washes the land is divided into individual fields each surrounded by ditches which are kept filled with water when the field is grazed to act as 'wet fences' (stock barriers) and for the cattle or sheep to drink from. In dry conditions water may have to be let in, or pumped in, from nearby rivers. The land wasn't so divided originally - see 'Shrinkage' section below. A number of adjacent wash fields are collectively "washes". There are about 300 fields in the Ouse Washes (later note: more than 400 fields identified by Mike Dellanoy of Mepal) and approx 140 km of ditches. This website is about these washes and the surrounding rivers and adjacent roads and structures which have helped create the washes, or have been built because of them. On the map far-left the Ouse Washes are just below the N of 'Fens'. 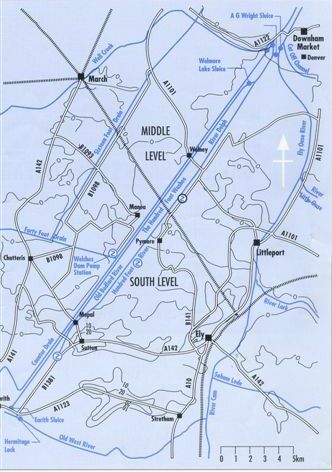 They occupy a ½-¾ mile (0.8-1.2km) wide strip of land set at an angle of approx 45 degrees on the map, starting at Earith, Cambridgeshire, running north-east into Norfolk, originally finishing some 21 miles (33.8km) away at Salter's Lode, but now ending 1½-2 miles (2.4-3.2km) south of there at the John Martin sluice at Welmore Lake. More of all that later. They are bounded throughout their length by two parallel rivers; on the west by the non-tidal Old Bedford/Delph; and on the east by the tidal New Bedford (also known as the Hundred Foot River or Drain). In the south, the boundary is a very short section of what is known as the Bedford Ouse (which is actually the Great Ouse River) and in the north it is a short stretch of what is locally and perhaps confusingly called 'The Tidal River', which is also the Great Ouse. I must point out that whereas I use "west" and "east" to refer to the sides of The Washes and the rivers, many others say "north" and "south". Just about everything to do with the Ouse Washes, which of course is really the Hundred Foot Washes, is confusing. 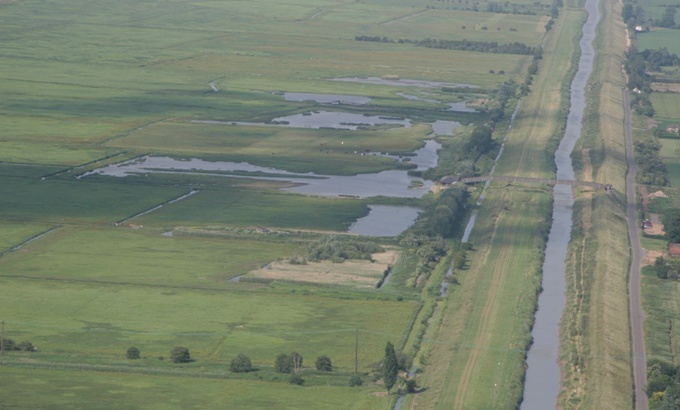 First and foremost, the Ouse Washes provide a winter floodwater storage area of nearly 6,000 acres, protecting surrounding lands from inundation from heavy upstream flows. They also have an important role in flood protection from incoming high tides. In Summer they provide grazing for cattle and sheep within the washes and irrigation for arable lands outside. Nature conservation is another major use, with a nature reserve and a wildfowl refuge. The Washes are recognised internationally as a "Site of Special Scientific Interest" (SSSI). Much of the system is navigable, although sometimes with difficulty in places, and one link to another navigation system has been closed due to leakage and lack of maintenance. Usage is however almost exclusively recreational. Links to other sites are shown either in "fly-outs" in navigation blocks that float down the page (as on this page) or at the bottom of pages on which the menu is fixed at the top. Museums listed will help you understand more about drainage, farming and rural life and help preserve our heritage. External sites or pages will open in new windows or tabs and this site will remain open. The "Fens, rivers & washes overview" by Peter Cox on the Welney Website gives a good concise summary and is worth a visit, but please come back!